Back on Zazzle, where I've posted some new designs. I've bought some of my own cards to check the quality and I'm really pleased - lovely glossy paper and vibrant colours. I bought some of the Christmas tree ornaments last year and they worked out well too. I might try and create a few more this year. In the Loop - a bit like Yes Minister, really. Follows a minister in the British government as he is manipulated by events, by his American counterparts and by the so-called advisors, in the run-up to the invasion of Iraq by American and British forces. Very funny, except it's probably closer to the truth than you'd like, exposing the bargaining and manipulation that goes behind closed doors, and how egos, rather than policy, drive major decisions. Revolutionary Road - with Kate Winslet and Leonardo DiCaprio. I had read somewhere when it first came out that you'd be better off reading the book than watching the movie. Well, I did both, and found both excellent. The movie is a close match to the book, and it captures the look and feel of the era perfectly (Well, I wasn't born, so I can't say really!). Loved it. Recount - the story of the how Al Gore didn't become President of the United States. I wouldn't have thought that a film about the legal battles that raged after the election would have held my attention. But it did. Really interesting stuff. And really scary too, how lawyers can manipulate the outcome of an election. Recommended. Quantum of Solace - James Bond. I just remember that it wasn't as bad as I thought it would be. But that's it. So it can't have been that good. And I still have no idea what the title means, though it's been explained to me. I have a few more movies to review, but we're getting through the list! If, like me, you like all things technical about painting, you'll find these videos on the Winsor & Newton site interesting. Haven't done any painting in the last couple of weeks. I've got a project in progress - another interpretation of my Clementines - but I'm not quite sure how to proceed with it. I'll try and make the time at the weekend. Rediscovered this song yesterday. The Boyzone version of "Baby Can I Hold You" was on Reeling in the Years, and it reminded me how talented Tracy Chapman is. From what I could find on Wikipedia, she's still on the go 20 years on, and 8 albums later. Must go and check what her new songs sound like! There are some movies I've seen months ago that I haven't got around to reviewing yet. So we're going to have to resort to drastic measures - group review. Morning Glory - with the Indiana Jones guy and Anne Hathaway and what's her name, the actress that's been in lots of Woody Allen movies. Clearly didn't make much of an impression on me. Entertaining enough for an evening, but I'm glad I didn't pay for a cinema ticket for it! Actually, it's not even Anne Hathaway, just someone who looks a bit like her. There were a few hilarious scenes - when they're desperate to improve the ratings, and the presenters will do just about anything. PS: I Love You - it was a great book. But why did they have to set the film in the US and the main actor (the dead guy) couldn't even do a good Irish accent? Hillary Swank is a good actress. She just picked a bad movie to act in. Read the book. Don't bother with the movie. The Hurt Locker - OK, it's set in Iraq or Afghanistan, it's about a bomb disposal squad. The main guy dies in the first scene. The new main guy is scary, he just keeps playing with death. Quite gripping. But some parts didn't seem credible - these guys seemed to operate completely outside of the chain of command. Can't remember how it ends. Probably badly. Kate Bush , Moments of pleasure ( Directors cut ). 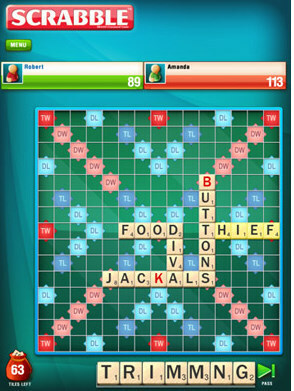 We discovered iPad Scrabble a few months ago. Actually, it was one of our customers who had it on her iPad and she said it was great, so off I went to the App Store. It's so easy to download apps, almost too easy - you don't need to enter your credit card details every time, so there is a disconnect between downloading an app and actually paying for it. Very clever, these guys at Apple! But there are lots of free apps and plenty @ €0.79, it's hard to resist. 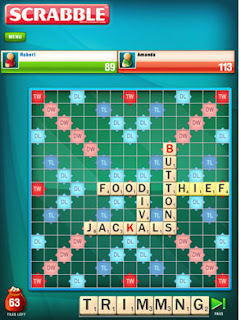 The Scrabble app was a little more, but still great value. We haven't played in a little while, but it was great to have when travelling. And the iPad is just the right size for it. The only trouble is that I'm very competitive, and a bad loser! It's a little while now since I read Jodi Picoult's first novel, Songs of the Humpback Whale. In some ways, I felt it was a more accomplished book than the last one I had read, House Rules, less formulaic, more original. It's a simple story of a relationship falling apart, a journey across America, the bond between a mother and daughter, and humpback whales. Like a lot of Picoult's books, the story is told in many voices, and it took me a little while to figure out who was who. Thankfully, there was no lawyer in this one - lawyers have become too much of a staple of Picoult's books. One feature I found interesting was that one of the storylines was told in reverse chronological order, so you knew what was going to happen before it happened so to speak - it was a little bit confusing at first, because you didn't know the characters yet, but I felt it gave the book an unusual richness. Siobhan Ryan is getting better at delivering the bad news! Mixed weather conditions for the week to come. 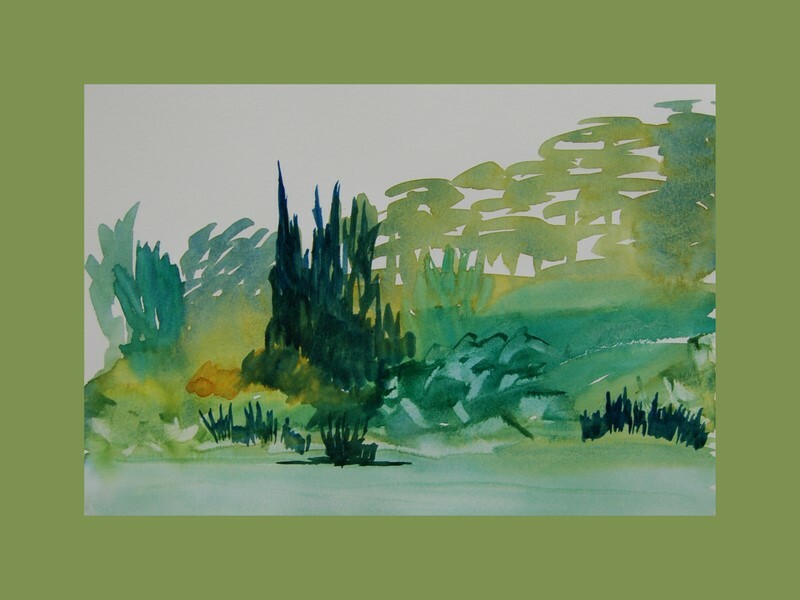 I've been reading about greens, so I've tried a few ranges, mixing cerulean blue, ultramarine blue, phthalo blue and, on the yellow side, aureolin, quinacridone gold. I'm particularly fond of the ultramarine+aureolin & ultramarine+quinacridone gold & phthalo+quinacridone gold. OK, I love them all. Whether I'll use them all in painting or not remains to be seen. The mixes with quinacridone gold are particularly rich and natural, and I must try a few mixes with phthalo blue nearly pure, just to see how dark they go. Of course I had to try these gorgeous colours on a little impromptu painting, inspired by a view from the salines at Peyriac de Mer (that's the name on Google Maps, but I'll have to check my notes, as that name doesn't ring a bell). But never mind the name, that's the location on the map here all right. We were standing on the little pontoon at the top right and we took a picture across the little pond, and there is a bit of an escarpment with trees and bushes on it. You can get a street view in Google, but unfortunately only from the road, l'envers du décor so to speak. As you can see even from the satellite map, plenty of rich greens to choose from! All done. One of the clementines was going green and fuzzy (and stained the scarf - it's going to have to go to the dry-cleaners) so I had to finish it today. As a result, I rushed the reflections in the glass a bit, but it's probably just as well. I'm pretty happy with the result all the same. And, in case you're wondering, yes, the clementine on the left appears to be floating. I should have made the shadow a lot darker to anchor it on the plate. I still think it's one of my better paintings. I'm going to try a freer version of it now, on bigger acrylic paper, maybe with oil pastels. 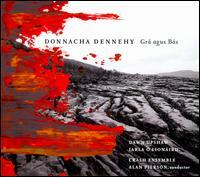 I'm listening to Grá agus Bás, the album by Donnacha Dennehy that combines the title piece and also That the Night Come, some of Yeats' poems set to music (commissioned and sung by Dawn Upshaw). I told you about these last year of course, when I was at the world premiere. It was after the concert that the CD was recorded. It has only just come out a couple of months ago. I find Grá agus Bás much easier on the ear in the recorded version than live, and overall, it's a beautiful piece. And I love Dawn Upshaw's voice, of course. So I was over the moon when I won a signed copy of the CD on a John Kelly Ensemble Facebook competition a couple of weeks back. On our trip to London last month (time flies, scary - have you noticed that some of the trees are turning yellow and brown already? ), we had dinner in our favourite Malaysian restaurant, Satay House. One thing I had promised myself was an Ais Kacang (Sweet red beans, jelly, creamed sweet corn topped with shaved ice, red syrup, palm sugar and evaporated milk). Well, I wasn't disappointed. It's big, it's gorgeous, it's full of flavour, but it is very cold, so probably best for a really hot day. I loved the texture of the red beans and the jelly, and the sweet sweet flavour. And, yes, I was glad we had decided to share a starter, so I was ready and able to eat it all! We've been to the Indian Brasserie in Rathfarnham Village a couple of times over the last few months. The last time was on the Bank Holiday Monday, using a CityDeals voucher we had bought the previous week. The first time we went, it was very quiet, but not this time - it was buzzing with CityDeals customers. The setting is a bit old-fashioned, but on each occasion, we found the food excellent and the service quite attentive. I had a lamb dish (Aad Chettinadu) yesterday, and it was tender and full of spicy flavour. Really enjoyed it. 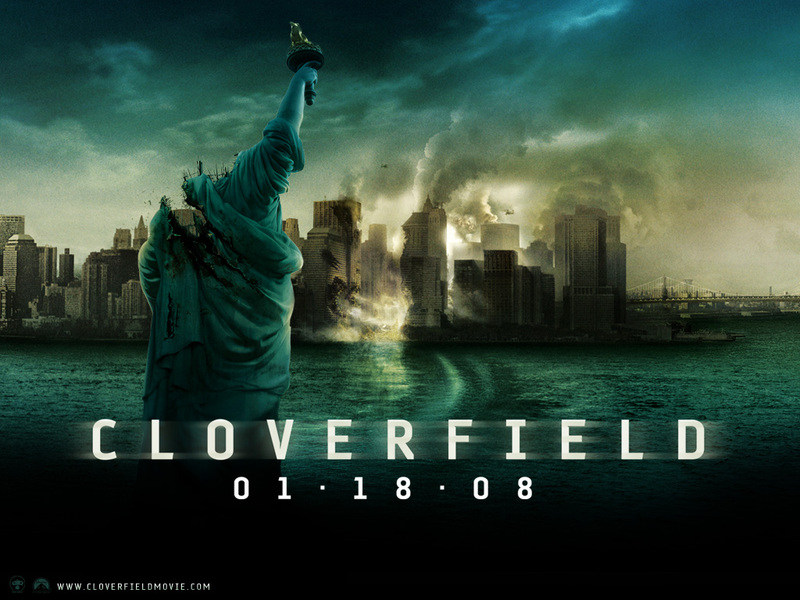 Brendan downloaded a movie called Cloverfield for the weekend. It was described as a sci-fi thriller shot in a "Blair Witch Project" style. But not scary horror movie like the Blair Witch Project, thankfully. It's the story of a group of young New Yorkers who become trapped in Manhattan as a monster attacks. Nobody knows where the monster has come from - is it from outer space or the depths of the seas, we don't know. And we don't know if the monster is intelligent, or just a plain old baddy monster. It's very big, and it also spreads little monsters that can creep and crawl into all sorts of spaces, and guns seem to have no effect on it. I managed to watch most of it -there are not too many unwatcheable gory bits. And it's a good story - the young people are not heroes, they are not going to save the world, though they embark on a dangerous trek across Manhattan to save their friend. A good action movie. The monster looks very convincing. Don't watch on your own if you're easily scared. 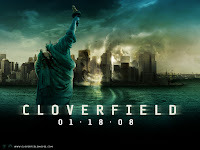 I had no idea why it's called Cloverfield, by the way, until I read the Wikipedia entry. 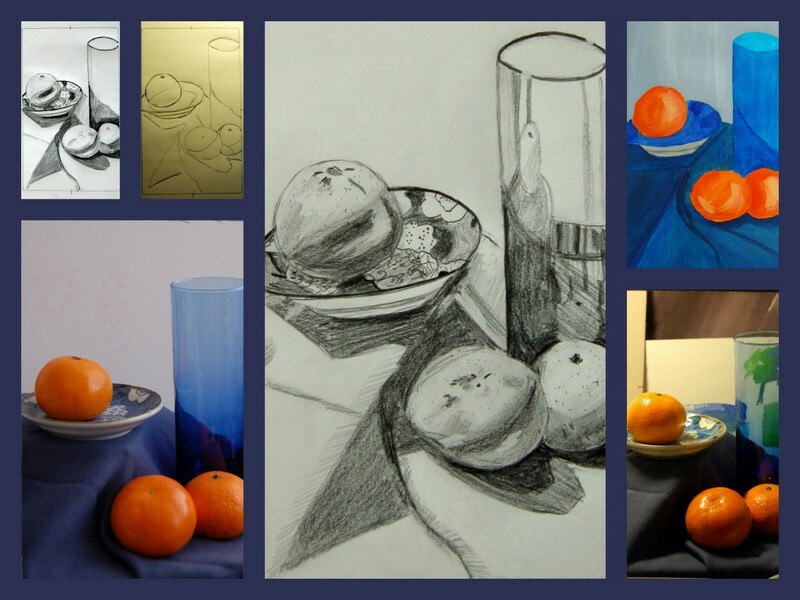 Here is a photo of the painting behind the still life. Very useful to be able to take such a picture to test how the colours are working . I thought that my clementines were too red, but, no, I think they are pretty good actually. I've left the 2 hardest elements till last, of course, the plate and the glass, but I'm encouraged by how the scarf has turned out, so I'm cautiously optimistic! 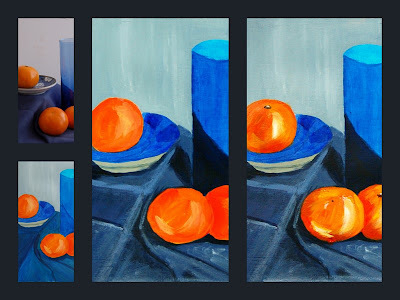 Managed to get the scarf colour the way I wanted, and I've reworked the clementines. Next stage - the Japanese plate. I've completed my drawing of the clementines. 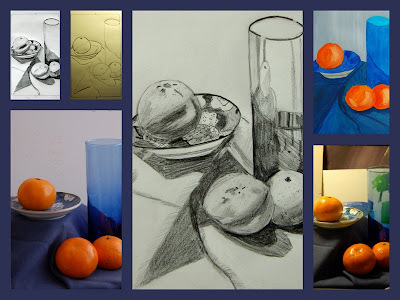 As I said, I'm not a neat drawer, but following the steps has paid off. I've also started painting the same subject with acrylics. The major difference between the two will be the lighting. In the drawing, I have a light shining from the left, with the rest of the room in the dark, so there is strong contrast. The acrylic is a day scene, with a very diffuse light-source, the window to the back of my desk, with a net curtain absorbing a lot of the light. It's early days - I've got a lot more work to do to finish this one, but I've got the basic shapes in place (I traced from my free-hand drawing, so it's not really cheating). My next step is to figure out how to mix the right blue for the scarf.